When I was about ten, I had a very clear idea of what a Real Volcano should look like. A steep cone, with a razor sharp rim and sheer cliffs down to an inner caldera with a bubbling pool of lava. Aah, it is to dream. It’s 3470 meters tall, in the Virunga National Park in DR Congo. Complete with steep inner cliffs and the world’s largest lava lake. He only slaughters people occasionally, but he can act decisively: during the 1977 eruption lava flow was clocked at up to 60 kph on the volcano slopes. I took the trek up (4.5 miles, but 4800 vertical ft, a lot of it on loose slidey volcanic rock) on Wednesday and overnighted at the top. The mighty volcano graciously gave us a good view of his lava lake. There was mist (and smoke from the lake) but we could clearly see the bright red lava. Most of it was simply red cracks between caked surface slabs, but there were periodic localized bubblings up of fresh red lava, sometimes leaping up in small fountains. We could hear a continual grumbling and rumbling from the lake. It was mega cool. I just sat and stared! Unfortunately on the way up we had hit rain. I had thought my camera was safe deep in my day pack, but I deceived myself. Other electronics survived OK, but the camera gave up the ghost and wouldn’t recover. So no exciting Nyiragongo lava pictures for me. Aargh! But it was still a great experience. 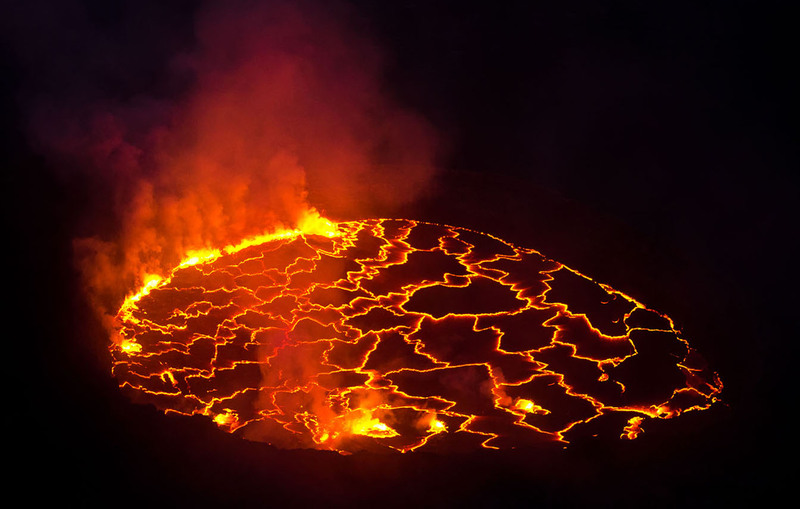 The photo below from the Virunga National Park website shows a typical night time view of the lava lake, very similar to what I experienced. I highly recommend Nyiragongo. I arranged my visit (transport in DR Congo, lodging, trek) though the Virunga National Park and it all worked out well.